As National Apprenticeship Week draws to a close, Bryn takes a look at what the events of the last five days meant for skills, schools and businesses. For anyone out there who lives in a Wi-Fi-less cave, this week is/was National Apprenticeship Week. That’s why we’ve been rabbiting on about them for the past five days, in case anyone was wondering. It’s been a pretty full on week; jam-packed with events, debates, conferences …stuff’s happened, is what I’m saying. And then, in the middle of all that, our Chancellor took some time out of his busy schedule to fill us in on the economy. Unlike the Autumn Statement last year, apprenticeships were notable by their absence from Osborne’s latest address. With some big changes announced in 2015 – like the Apprenticeship Levy, the 3 million Apprentice Challenge – maybe George felt that it was time to focus on something else. That’s not to say that some of the other announcements made won’t have an effect on apprenticeships. Education, in more general terms, was one of the key (and most controversial) points brought up in the budget report. Osborne announced plans for every school in the country to become an academy. Currently, 2,075 out of 3,381 secondary schools in the UK are academies, as well as 2,440 of 16,766 primary schools. As an article on the BBC website yesterday showed, Osbourne’s plan was met with some fairly stern opposition from certain members of the education sector. In the article, the general secretary of the National Association of Head Teachers said: “The shift to universal academisation will probably not produce the benefits that the Chancellor hopes for and the price paid for the change will be high”. At UKFast we’re a little bit more optimistic than that. As our Director of Training and Education, Aaron, pointed out when we quizzed him on the government’s plan, it could actually make the system more flexible and help businesses to engage with young people. As we found out at the National Apprenticeship Service’s North West Large Employer Conference on Tuesday, engagement in schools is essential to the government’s apprenticeship targets. Many of the speakers highlighted this point, saying that it’s one of the key elements of the apprentice strategy and businesses and schools are falling short on. “There’s a lot of talk in tech and other industries at the moment about the lack of digital skills – how young people don’t enter the job market with the skills that businesses need,” said Aaron. “I think that businesses need to take a lead on changing that by actively seeking out talent, going into schools and inspiring young people. We think businesses should approach developing people with the same tenacity that they apply to making sales or innovating new products. “We believe that this is the way forward for education – equipping young people with the real-world skills that they need to succeed in business. Our partnership with the Dean Trust in Manchester is a prime example of this strategy in action. As their official technology partner, we do more than just provide them with IT. We offer masterclasses, work experience, apprenticeship careers at UKFast and have helped design their IT curriculum,” said Aaron. As more people (in businesses and schools) start to realise that apprenticeships are the key to future-proofing the UK economy, perception of them is changing – now they are held with same esteem as A Levels and Degrees. At the North West Large Employee Conference this week, Karen Woodward – the Director of the National Apprenticeship Service – outlined how school league tables are going to change to reflect the value of apprenticeships. She explained that, at the moment, schools are essentially rated on exam results and how many kids they get into uni, the new system will actually reward schools that promote apprenticeships. Sixth form colleges will also be ranked on how many pupils they place in apprenticeships, rather than just university. In a week where apprenticeships have been a key focus, the announcement of these changes is intended to alter perceptions. It’s about time we all moved away from the idea that apprenticeships play second fiddle to a university degree and saw them both on a level playing field. If that’s not a mission worth devoting a week to, then I don’t know what is. 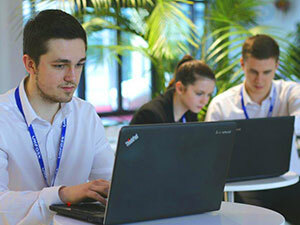 For more information on the UKFast apprenticeship scheme take a look at our website.